Above you can find, 'Harbour Town,' a classic Pete Dye design. Growing up in Melrose, Mass., a small city seven miles north of Boston, Moss played sandlot baseball, hockey, and tennis. He spent summers traveling New England in search of every golf course he could play. His affection for natural beauty and sport manifested in posters he designed in high school and earned him a scholarship to Vesper George, a then prominent art school in Boston. Moss’ subsequent lifetime collection of art spans a wide range of artistic media utilizing oil, acrylic, tempera, watercolor and enamel for his representations of dramatic sports moments, places and figures. After four years with the Marines, Donald Moss returned from World War II ready to work and eager to paint. He moved to New York where he attended Pratt Institute and began work as a freelance artist and designer for magazines and ad agencies such as Colliers and Esquire. 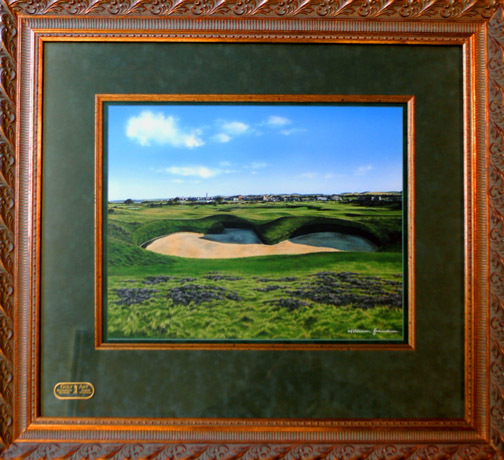 His work is recognized by tennis players, skiers, golfers, car enthusiasts, and many who watch television. His accomplishments include trademarks and logos for AMF/Head racquets, Olin Skis, the American Broadcasting Company (ABC), and Mercedes-Benz. In 1978, Moss was commissioned to design the official poster for Super Bowl XII. Six million prints of the poster design were distributed nationwide bearing his name. 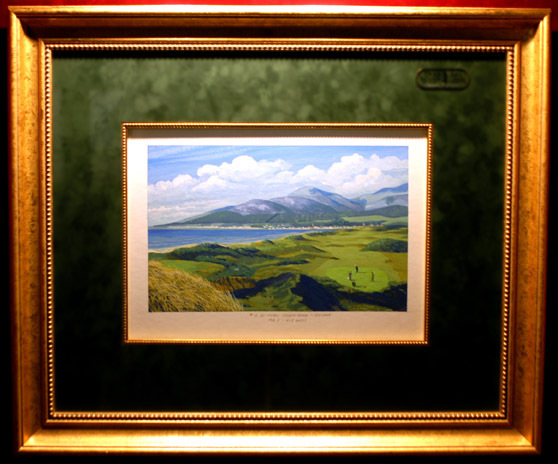 His work has been commissioned by, among others, Arnold Palmer Enterprises, Golf Digest and Sports Illustrated. But even a viewer who has not seen firsthand the famed 13th hole at Augusta or the 14th at Mahogany Run in the US Virgin Islands—both available for viewing in the ASAMA collection—can appreciate the affectionate splendor of Moss’ painted interpretations of them.